A Bollywood icon and an American pop star come together to share their love and talent with their friends and family the night before they become man and wife. Did anyone really expect Priyanka Chopra and Nick Jonas’ sangeet to be anything less than a musical extravaganza? 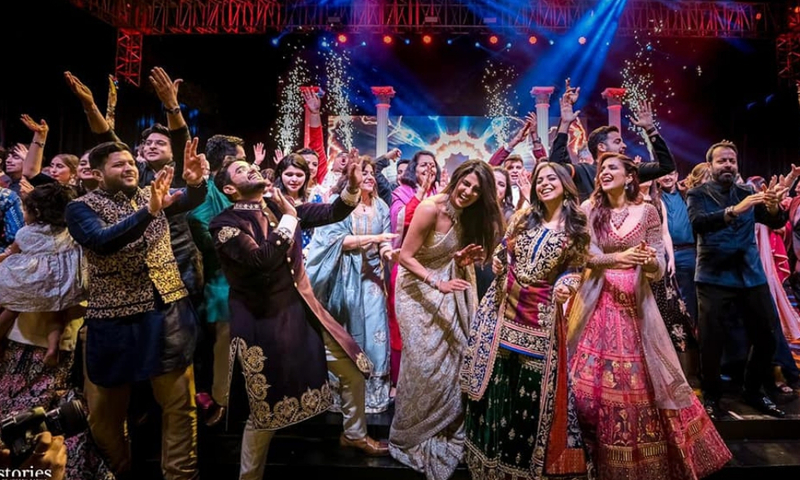 Earlier today, Chopra released a video montage and pictures from inside the pre-wedding event, and it looks like the stage show of our dreams. The sangeet took place on November 30 on the lawns of the Umaid Bhawan Palace, where the festivities are being held all weekend long. The bride and groom’s families were both in on the action. Chopra shows us where she got her killer moves as she dances with her mother, Madhu, and brother Siddharth is pictured jamming along with the rest of the Chopra khandaan. Chopra’s cousin Parineeti also appeared in a special performance during the night of fun. Jonas’ brother Joe and his fiancée, actress Sophie Turner, can be seen breaking it down in true Bollywood fashion as the groom stars as lead singer and dancer. Jonas’ other brothers Frankie and Kevin and sister-in-law Danielle are captured cheering from the front row. There was also a large trophy to honor the winning team (Team Bride or Team Groom), but according to Chopra, the healthy competition brought the families together in the end. “It all began as a fierce song & dance competition between the families but ended, as always, as a huge celebration of love,” Chopra captioned her Instagram post. Chopra, styled by Ami Patel, was wearing gold and silver sequined sari by Abu Jani Sandeep Khosla. Jonas, clothed in a midnight blue sherwani, and his brothers were also dressed by the designer duo. Abu Jani Sandeep Khosla were additionally responsible for the design and execution of the event. Chopra also shared unreleased images today from another competition between the families that took place during her mehndi: a cricket match. Team bride and team groom competed in a cricket game post @nickjonas and @priyankachopra's mehendi ceremony. The men of the two families sported customized team shirts. Chopra posted a dreamy clip of Jonas at bat during the game, looking very much in his element. @nickjonas certainly isn't taking too long to get the hang of cricket. Chopra and Jonas were married in Christian ceremony on Dec. 1, with a Hindu wedding ceremony taking place today in an effort to honor both of their faiths. We’re looking forward to more pictures from the beautiful couple in the coming days as they continue to celebrate with friends, families and colleagues.